Guess who is back for another round with the Reapers? Commander John Shepard takes another shot at finishing off the galaxies worse enemy, only this time we actually get to see more of what happens after all the death and destruction, instead of some flashing lights and a Buzz Aldrin voice over. 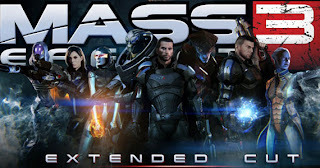 Bioware released the Mass Effect 3: Extended Cut DLC for free on June 26, and I decided to pop in the game to see what’s changed. If you haven’t played the Mass Effect Series, or don’t know the ending yet, you’re out of luck. Spoiler Alert: I will mention parts of the previous ending, and the new one. 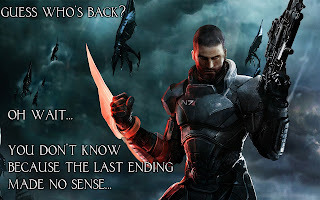 If you wondering whether you should read on, first read my review of Mass Effect3, and then play the game. I promise you will enjoy it. So with the extended cut, each main ending (the choice to destroy the Reapers, control them, or synthesize all synthetic and organic life to form new DNA) receives an additional 8-13 minutes of extended cinematics and dialogue. There is also a fourth choice that is a great nod to the fans wish for the ability to stick it to the Reapers. I won’t tell you how to get it but it is pretty easy to figure out once you gain the ability to move. Each ending still shows Joker flying the Normandy as fast as he can away from the giant colored ball of light of your choice. 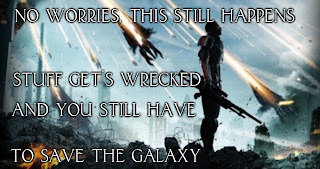 You also still land on some planet and the Mass Effect Relays are still destroyed. With the DLC, the extended cut adds in more scenes that provide a lot of context to the endings and what happens after the Reaper battle. Now there’s added scenes that show the Admiral ordering all ships to get the heck out because Shepard fired off the Crucible, and the Normandy actually taking off after “crash landing”, implying that life goes on and the Normandy crew aren’t stranded somewhere. The new scenes are mostly still frames of artwork with a voice over, talking about how they move on, or how each species rebuilds and has peace with other species. Each of the three choices gives you a different voice over and a few snapshots that are unique to that choice. I would feel bad if I actually went into details about the endings, but if you feel compelled to watch them, G4 has each extended endingfrom start to finish. Personally I am exceptionally satisfied with the extended endings. I was not as rage-induced as other people were in regards to the original endings, but these extended cut scenes definitely gave some much appreciated context and an epilogue of sorts that let me feel happy about finishing the game. I hope this kind of post-production-ending editing is a unique occurrence, because I would be concerned if people can complain loud enough and get the ending to the next Call of Duty changed. Either way the fact that Bioware listened to the fans and released this for free says a lot about their commitment to not only artistic vision but their ability to admit their wrongs and work to fix them. If you go back and play through it again, I suggest taking the synthesis route. It is extremely satisfying if you played the game with a high Paragon Score.